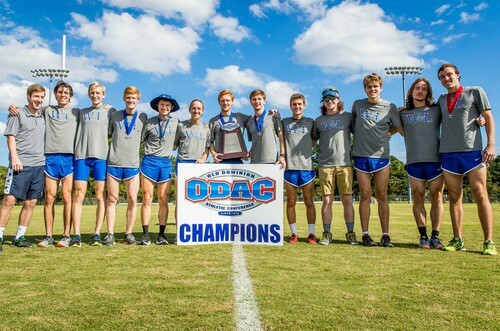 VIRGINIA BEACH, Va. — The Washington and Lee men’s cross country team recorded its lowest team score since 2005 en route to winning its third straight ODAC title on Saturday at the 2017 ODAC Championship hosted by Virginia Wesleyan. The Generals registered 27 points, with four runners in the Top 6, to claim the 12th ODAC title in program history. Bridgewater finished second with 48 points, and Lynchburg claimed third (85 points). At the conclusion of the meet, junior Hank Patrick (Baton Rouge, La./University Laboratory School) was named the ODAC Men’s Cross Country Scholar-Athlete of the Year. It marks the third straight season a member of the Generals has earned the award. Senior MacKenzye Leroy (Port Jervis, N.Y./Port Jervis) was the Blue and White’s top runner, as he finished second for the second consecutive season. He crossed the finish line with a time of 25:06.90 on the extremely flat and fast course to place second out of 94 competitors. Patrick was just behind Leroy to claim third in 25:07.10. Junior Cooper Baird (Fort Worth, Texas/Fort Worth Country Day) was right with Leroy and Patrick, taking fourth with a time of 25:07.70. Sophomore Austin Kinne (Bolingbrook, Ill./Neuqua Valley) placed sixth (25:27.00). First-year Freddie Marx (Greensboro, N.C./Walter Hines Page) rounded out the scoring for the Blue and White by claiming 12th in 26:01.70. The winning score of 27 points is the lowest in the ODAC since W&L won with 26 points in 2005. Leroy, Patrick, Baird and Kinne each earned First Team All-ODAC accolades with their finishes. This is the second time Leroy has made the first team and the first time Patrick, Baird and Kinne garnered the honor. The last time W&L had four runners on the first team was during the 2007 season. Marx earned a spot on the All-ODAC second team with his 12th-place finish. This is the first time W&L has had five runners on the All-ODAC teams since 2007. Junior Robert Hiegel of Bridgewater claimed the individual title in 24:35.40. First-year Daniel Cope (Dallas, Texas/St. Mark’s School) took 16th with a time of 26:16.70, junior Joe Carmody (Clive, Iowa/Dowling Catholic) was 18th in 26:23.20, junior Alex Dolwick (Apex, N.C./GRACE Christian School) placed 22nd (26:34.10) and first-year Sam Noden (Princeton, N.J./Lawrenceville School) was the team’s ninth runner in the Top 30, as he finished 28th in 26:51.30. The Generals next compete at the NCAA South/Southeast Regional on November 11 hosted by Christopher Newport.